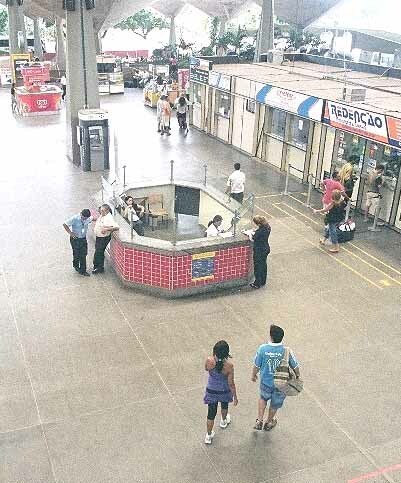 using the Fortaleza Bus Station! TERMINAL RODOVIARIO ENGENHEIRO JOAO TOME is the Fortaleza Bus terminals official name. Was Contstructed in 1973 and will be celebrating its 45th anniversary this year. The building is well organized, easy to get around in, and kept relatively clean. With fair warning, is not much to look at, but gets the job done. A daily average of over 8000 passengers. 35 Bus companies and close to 200 bus lines coming and going around the clock! or Canoa Quebrada R$ 50,00 ! is headed the direction of the information booth. LOCATION: Fortaleza Bus Station is centrally located within the city limits. Only 2 miles or 3 km from the city center and 5 kms/3 miles from Praia de Iracema. Fortaleza Bus Station is accessible by at least 2 city bus lines, AV. BORGES de MELO I and bus line AV. BORGES de MELO II. Not the worst place in the world to get stuck waiting for a bus. There are a few restaurants, cafes and souvenir shops. The Military Police are stationed there 24 hours per day. There is a Taxi Stand at the front entrance. The Secretary of Tourism has an office on the second level. A Post Office "Correio" 200 meters/yards from the entrance. Cash Machines (No Cambio to change foreign currency), public telephones and public toilets. BAGGAGE STORAGE: "Guarda-Volume" near the main entrance. For up to 12 hours R$ 3.10(small bag) R$ 6.20 (large bag), Additional periods of up to 12 hours R$ 2.00 (small bag) R$ 4.00 (large bag). MAKE SURE THE BAG IS LOCKED. Tips on choosing the safest buses and buying your tickets! What you should know about choosing the best Fortaleza Interstate Bus Companies to the bordering states, Maranhao, Belem De Para, Salvador, Fortaleza-Rio De Janeiro, Sao Paulo.